SYMES, GEORGE BURNS, merchant; b. 20 Jan. 1803 at Quebec, son of George Symes, merchant, and Angélique Miot, dit Girard, widow of Augustin Cuvillier; m. 9 May 1844 at Montreal Mary Ann Cuvillier, eldest daughter of Austin Cuvillier*, and they had one daughter; d. 12 June 1863 at Montreal. George Burns Symes’ father, a native of Tenby, Wales, immigrated to Quebec City and by 1801 had established his own forwarding business, George Symes and Company, dealing in wheat, rum, furs, and timber, and in passenger traffic. George Symes built up contacts with Montreal financiers such as Austin Cuvillier, who became his stepson in 1802, the year he married Angélique. During the 1820s the Symes Wharf at the foot of Cap Diamant was one of Quebec City’s busiest. Between 1818 and 1824 he served as master of Trinity House, which administered the Quebec harbour, regulated shipping, and arbitrated disputes between merchants. He was also a founding member in 1816 of the Quebec Exchange; it offered a reading room and the conviviality of a location in the basement of the Neptune Inn, but its primary purpose was to bring together merchants and ship captains: notices could be posted offering freight and charters, and captains seeking a cargo made the Exchange their first stop. George Burns Symes lived for part of his childhood on Rue Saint-Pierre and then on Rue Saint-Stanislas. From 1816 to 1819 he studied business in England. By the 1820s he was active in his father’s business and represented the company on the Quebec City Committee of Trade. After his father’s death in 1833 the firm was renamed G.B. Symes and Company; by the 1840s Symes had taken in a new partner, David Douglas Young, president of the Quebec Bank. After George Burns Symes’ death the company continued as D.D. Young and Company and subsequently as A.F.A. Knight and Company until it went out of business around 1880. As a general merchant George Burns Symes traded in commodities as diverse as pig-iron and lobsters. An 1847 advertisement showed imports of sail twine, carpeting, glass, paint, tea, soap, and cod oil. He exported, primarily to England, such goods as flour, beef, pork, candles, oatmeal, moccasins, and timber. In the early years he advertised passage on sailing vessels making the return voyage to Liverpool or Hull, England. 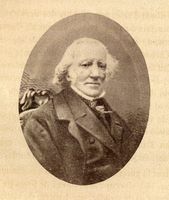 In 1854 Symes, along with such prominent Montrealers as Hugh Allan*, Sir George Simpson*, and William Dow, became a founding director of the Montreal Ocean Steamship Company. As Quebec City agent for the steamship line, Symes offered first-class passage to Liverpool for $80. Symes was a shipowner of some significance. He and Young were owners or part owners of at least 16 vessels in the period 1841–63, including the 889-ton Clara Symes. 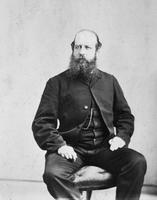 He also invested in the Quebec and Richmond Railway and was a director of the St Lawrence Navigation Company. Banks were a crucial part of the commercial process for timber merchants, since their businesses required extensive credit advances to the timber-cutting companies. In 1844 Symes was a director of the Quebec branch of the Bank of Montreal and in 1861 a local director of the Bank of British North America. G.B. Symes and Company, along with Peter Patterson*, Charles Aylwin, and Allan Gilmour*, took an early interest in the timber trade. The Symes’ timber cove was located at Spencer Cove (Anse au Foulon) next to the Allan Gilmour property. During the spring season, rafts arrived at the coves from upcountry. Once in booms the square timber was classed, although most of Symes’ timber was sold without culling. By May the coves were jammed with ships taking on their cargoes of oak and pine; in July 1851 three timber ships left the Symes’ cove on the same day. If the rafts were delayed, ships had to wait, stevedores became restless, and contracts went unfilled. In June 1850 a Liverpool merchant took suit against Symes for a two-week delay in loading. George Burns Symes lived for most of his life in a fashionable house on Rue Mont-Carmel in the upper town. He retired from business in 1862 and after a short illness died in Montreal of “inflammation.” His body was brought to Quebec City by the Grand Trunk Railway. Obituaries referred to Symes as “the Merchant Prince” and speculated that his estate had a value of $500,000. 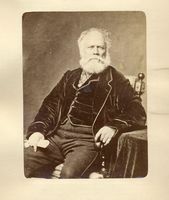 His funeral service was held on 15 June 1863 in the Anglican cathedral, and his pallbearers included Justice René-Édouard Caron*, Louis Panet, James Bell Forsyth, and William Price. His remains lie in Quebec City’s Mount Hermon Cemetery. ANQ-Q, AP-G-278/1; Greffe de J. G. Clapham, 12 juin 1850. ASQ, Polygraphie, XXXV, 14. Can., Prov. 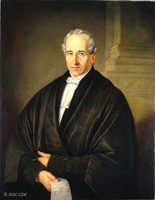 of, Statutes, 1852–53, c.62; 1854–55, c.44. Le Canadien, 15 juin 1863. Le Journal de Québec, 13 juin 1863. Morning Chronicle (Quebec), 31 Dec. 1847; 5 March 1852; 30 June, 29 July 1856; 16 June 1863. Quebec Gazette, 20 Nov. 1833. J. E. Defebaugh, History of the lumber industry of America (2v., Chicago, 1906–7), I, 139. George Gale, Historic tales of old Quebec (Quebec, 1923), 165; Quebec twixt old . . . and . . . new (Quebec, 1915), 55. A. R. M. Lower, Great Britain’s woodyard: British America and the timber trade, 1763–1867 (Montreal and London, Ont., 1973), 220. Bibliothèque et Arch. Nationales du Québec, Centre d’arch. de Québec, CE301-S4, 10 sept. 1763, 3 nov. 1778; CE301-S61, 18 juill. 1802, 27 févr. 1803, 19 nov. 1833, 15 juin 1863; Centre d’arch. du Vieux-Montréal, CE601-S84, 9 mai 1844; “Recensements paroissiaux de Notre-Dame-de-Québec”: www.banq.qc.ca/archives/genealogie_histoire_familiale/ressources/bd/instr_recensement/recensement (consulted 28 July 2017). P.-G. Roy, Toutes petites choses du régime anglais (2 sér., Québec, 1946), 2e sér. : 109–110. Ville de Montréal, Section des arch., BM7-1. Brian Young, “SYMES, GEORGE BURNS,” in Dictionary of Canadian Biography, vol. 9, University of Toronto/Université Laval, 2003–, accessed April 19, 2019, http://www.biographi.ca/en/bio/symes_george_burns_9E.html.